What is that smell!? It was perplexing and it was unpleasant enough that we needed to figure it out! Of course, in an RV you fear “black tank” (bathroom) odors but that wasn’t the problem as the odor was in the kitchen area. Randy cleaned and flushed the gray tank numerous times and that didn’t solve the problem. We thought something was rotten or dead somewhere but we couldn’t find it. After a couple days and a couple of very thorough cleanings with vinegar, Randy decided the offending item had to be in or behind the slide out pantry located between the stove and refrigerator. When he bent to remove everything from the pantry, he happened to notice one of the knobs on the propane stove was just slightly ajar/open. Problem solved! We hadn’t cooked on the stove in a couple days and the weather was nice enough to have had the windows opened all the time so there was never enough propane to set off the alarm or pose a health danger – just enough to have an odor and drive us crazy! Randy feels like his engineering skills must be getting rusty –in hindsight he thought he should have figured that one out much sooner. The end result is that we have a VERY clean kitchen, and finally, no odor. Natural gas is both odorless and colorless, so gas providers add an ingredient called mercaptan to it so you can detect its presence. If they did not add mercaptan, it would be hard for you to know that unlit natural gas was coming from your stove after you left the valve turned on. And leaks from furnaces and hot water heaters would be nearly impossible to detect without expensive equipment. So mercaptan’s smell is a very valuable safety feature. Mercaptans contain sulfur. That’s what makes them smell. The kind gas providers use blends well with natural gas and, in a gaseous state, has much the same properties as natural gas, so it will also rise and dissipate with natural gas. We have spent the week at one of our membership campgrounds and have enjoyed the area and our campground neighbors. We are just a few miles from the border and many Canadians vacation here. It has been interesting to have conversations with them about health systems, taxation levels and the number of days they are allowed to be in the US (182). Even crossing the border to get gas, which seems to be a common event, costs them a day. We have wonderful neighbors from Canada on both sides of us. One retired as the director of Mission Aviation Fellowship in Canada. (We are very familiar with Mission Aviation Fellowship as their US headquarters are in Nampa and several people we know at Cole Community Church work with MAF). In fact, as we were leaving to go visit the Dutch community of Lyndan this morning, he and the neighbor on the other side both offered to keep Elko for us while we were gone. Elko is such a hit with his mild manners…but, we took him with us! We were also able to enjoy a nice afternoon with my brother, Kyle, and his girlfriend Trish. We don’t see them often so it was great to visit. We watched the World Cup finals together on Canadian TV. We had our choice of an English or French broadcast. In fact, each evening we can choose (or not) to watch the news in English, French or Mandarin Chinese. There is a broadcast in each language. Birch Bay, here on the Puget Sound , is nice but we don’t have the appreciation for salt water and the marine smell that many do. 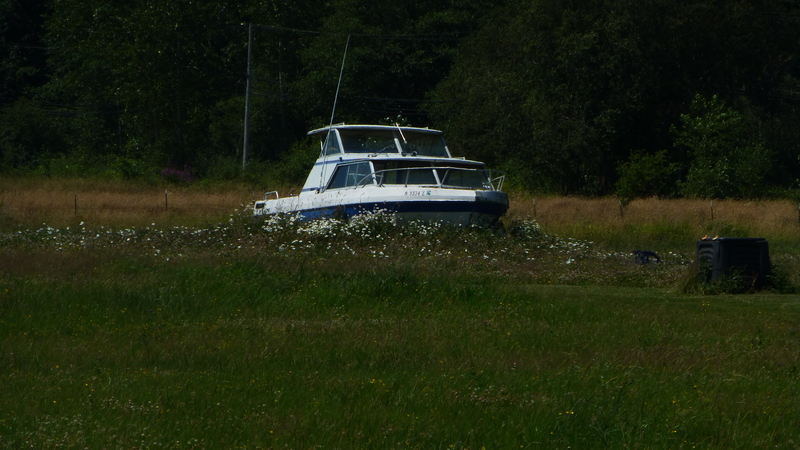 We did, however, really like this boat in the meadow! Driving here from Winthrop was stunningly beautiful. Highway 20 across northern Washington (closed in the winter) goes through North Cascades National Park but it wasn’t just the park that was beautiful. The whole journey was so nice that we didn’t listen to the radio or podcasts, we just enjoyed the view. 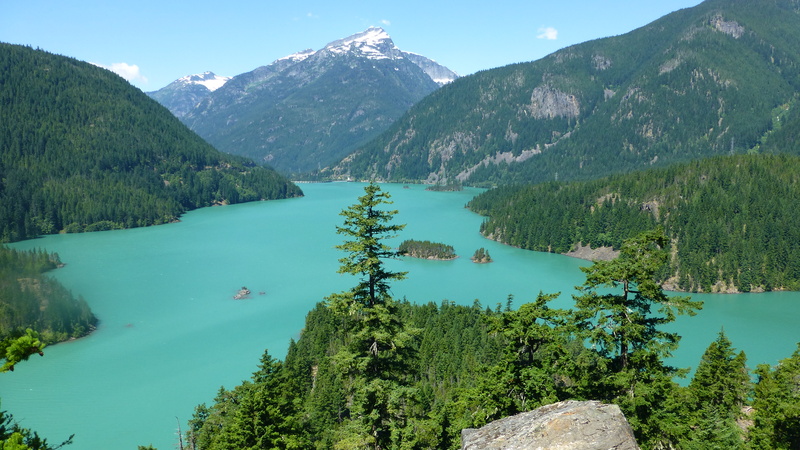 Lake Diablo was especially beautiful with its blue green color from glacial silt. It is interesting to me that after worrying about our old truck pulling our old trailer UP the mountains, I now wonder about this truck and trailer getting DOWN them. 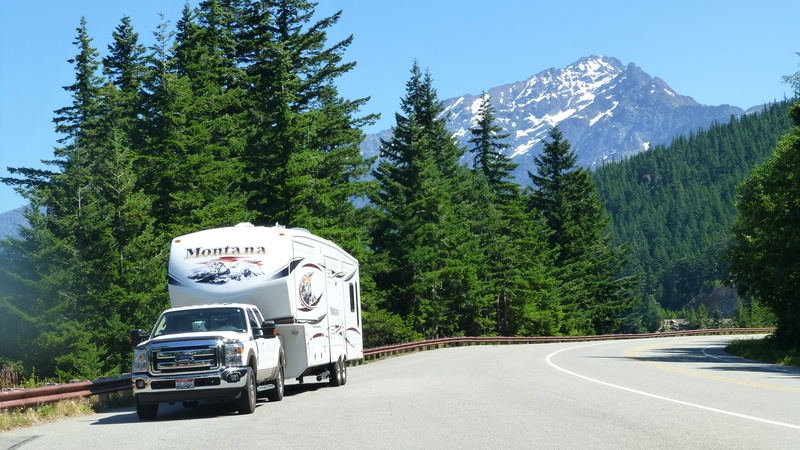 Our mountain grades have been so steep in several areas this summer, and this trailer is so heavy, that I worry about braking. Randy feels like he is getting better at letting the transmission do the work instead of the brakes. When I finally do start driving the truck and trailer together, I want flat, straight roads to learn on. I know there is one of those coming up between Bend and Boise in mid-August! I think I can wait until then. 3 Responses to What is that smell?! Lake Diablo is stunning! Thanks for your update with pictures. Gary and I did an all day hike in the North Cascades and it was one of our all time favorite’s. I remember Lake Diablo and how beautiful the drive was. So glad you’re having such a good time and that Randy is driving safely. It was one of the best drives, beautiful like southern Utah.